One hundred fifty two Indian sailors have arrived in Russia’s St.Petersburg to be trained for service aboard the INS Vikramaditya , a modified former Kiev class aviation cruiser originally known the Admiral Gorshkov. 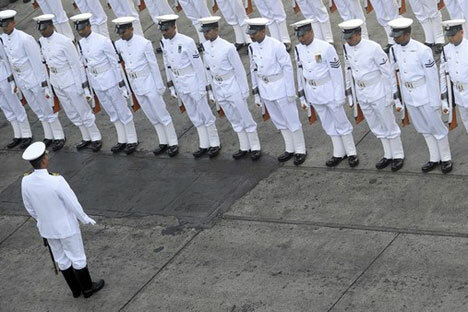 The Indian sailors and officers in Russia will undergo four months of theoretical training followed by practical training spanning the same duration. In 2012 INS Vikramaditya will be transferred to India under an agreement to modernize the country’s fleet signed in 2004. The ship, with a displacement of 45,000 tonnes, will be the heaviest aircraft carrier to sport the Indian Navy colours to date. The ship's total crew strength will be 1,400. Now the ship is being refitted in Russia’s port of Arkhangelsk.